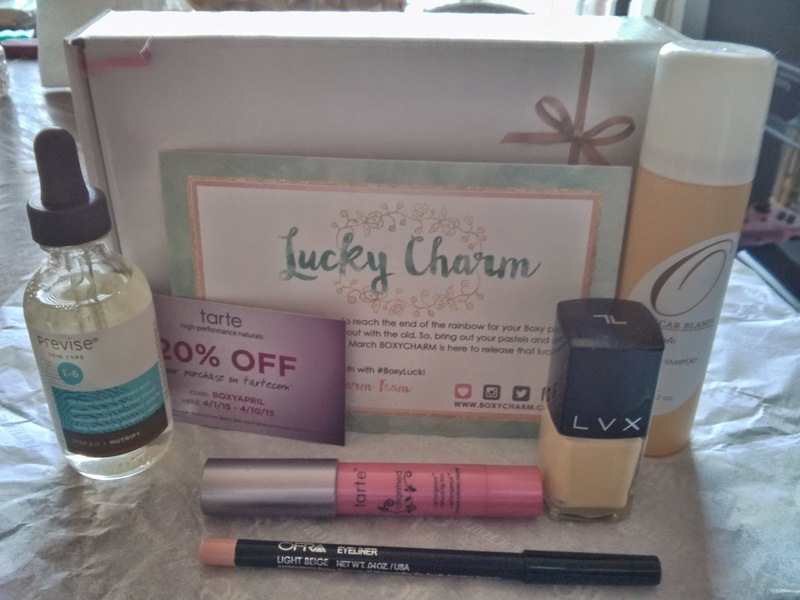 B's Beauty and Books: BoxyCharm Unboxing: March's Lucky Charm Box! 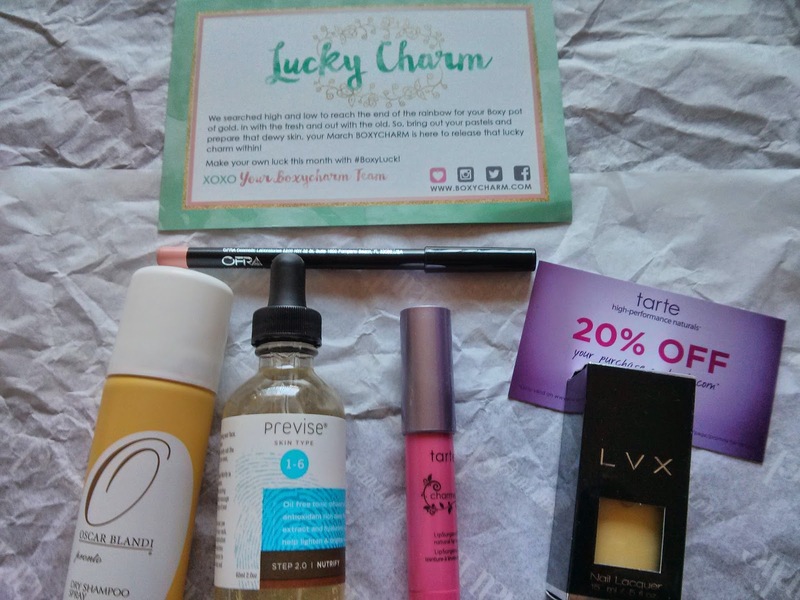 BoxyCharm Unboxing: March's Lucky Charm Box! It's that time again! Unboxing for my favorite beauty box out there! 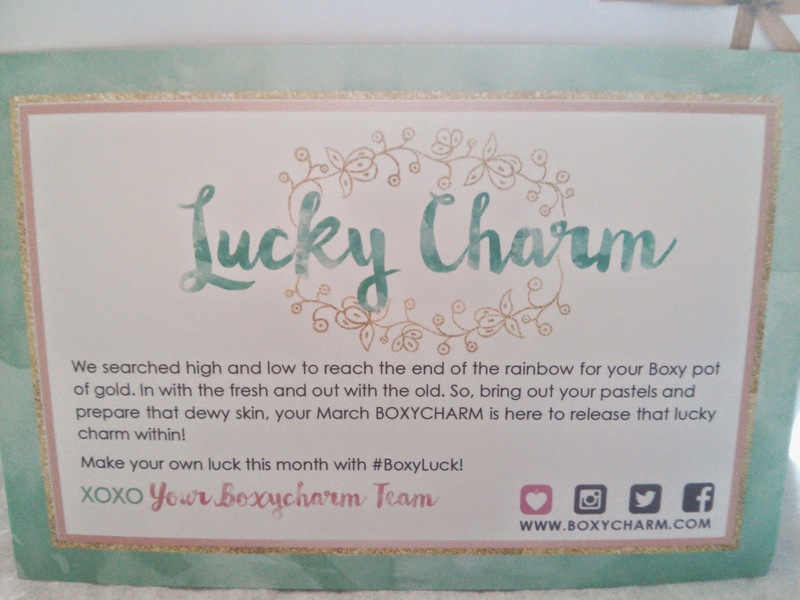 BoxyCharm: March's Lucky Charm Box! Subscribe here: B's Beauty & Books BoxyCharm Referral! To be totally honest, not crazy about this product. Apparently it could come in mint green, this buttery yellow, or this salmon pinkish orange color. The color is sheer, which is nice, but the packaging is awful. The LVX cover just slides off and it seemed like it was glued to the twist top at one point. But if the color holds up I will be really happy. For $16 though, would I buy it, probably not to be honest. Remember that white eyeliner craze a few years back? Yeah I think this took the place. Sorry about the awful picture, but I have to say, one of my favorite products in the box. It is a smooth eyeliner that brightens without being that obnoxious white. 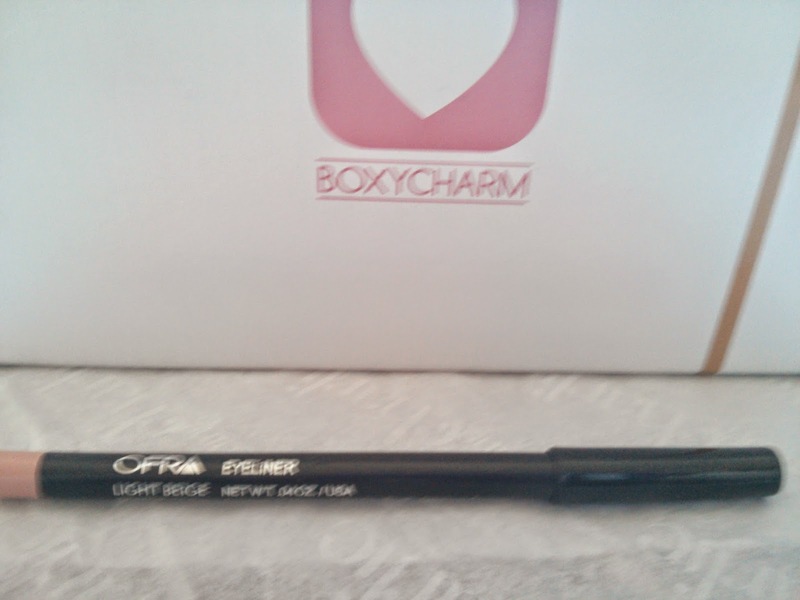 OFRA isn't my favorite brand, but I really dug this! I have no experience with dry shampoos so I am excited to try this actually. But I think I am going to have to reach out to some hair friends of mine to find out what they think of these products and go from there. This is the second month in a row that Boxycharm has done the lip crayon thing, and whereas last month I wasn't crazy about it, this month I LOVE IT! 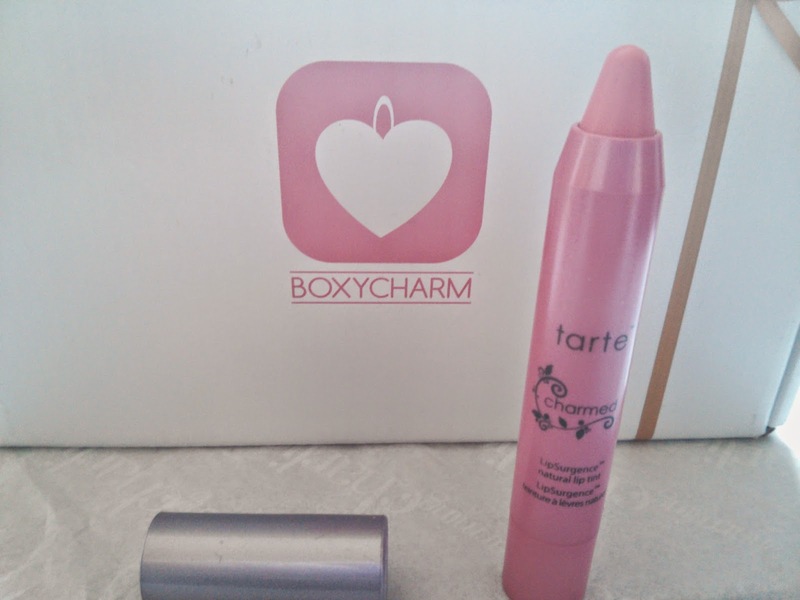 tarte has a very smooth and silky formula and it went on so easy. The color is a bit pink for me, but it insured I went to tarte and used my discount card they gave me this month to buy one in a shade more like me. Great product! This was the most exciting product in the box for me! 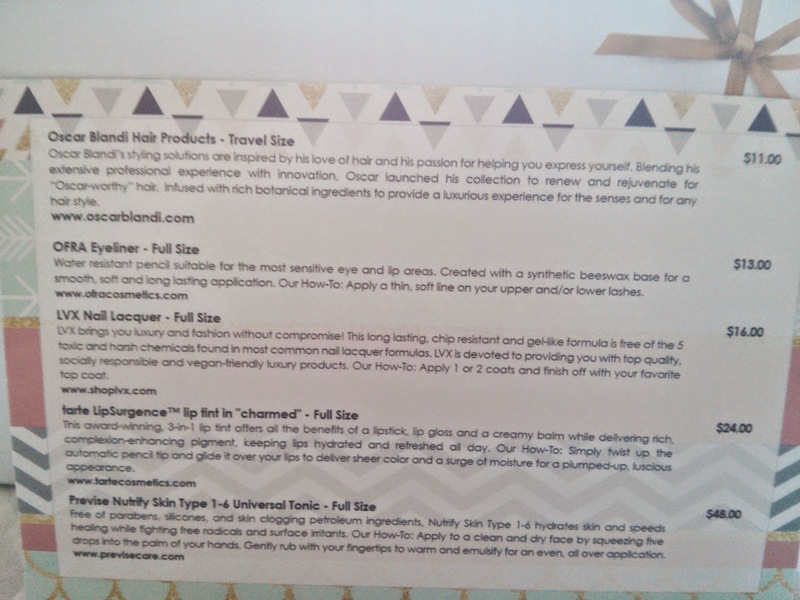 I am a skin care junkie (after all I am an Esthetician), so this was right up my alley. 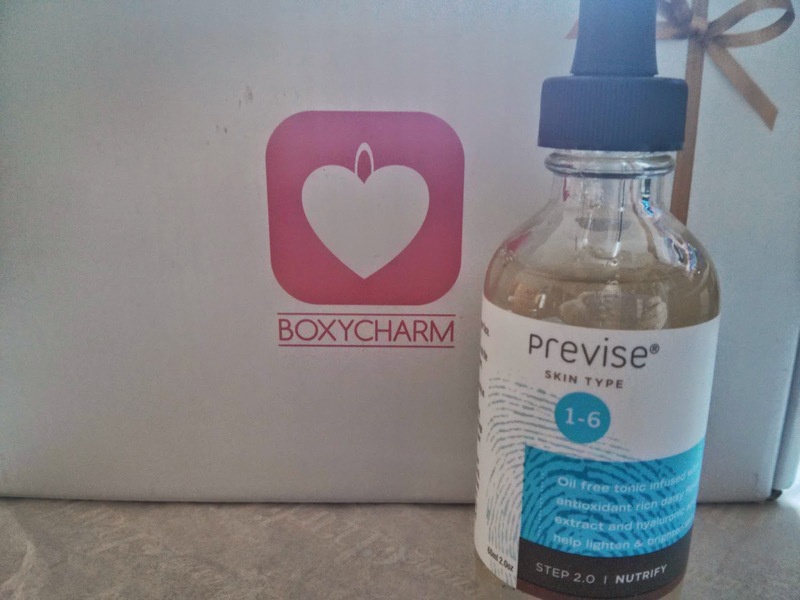 I had never heard of Previse before so I jumped right in, yes without even doing a patch test...tsk tsk. 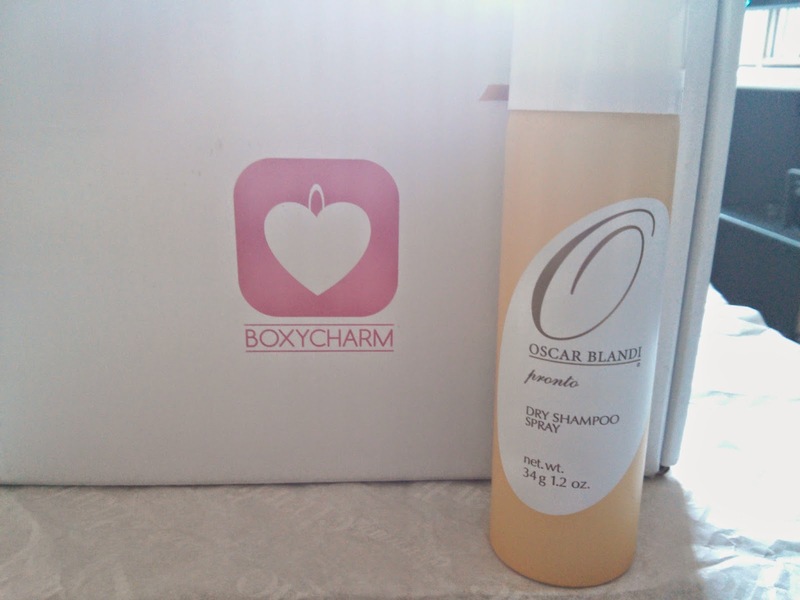 I loved the product! I have been using it about a week and you can see the difference in my skin. And for $48, it is almost a steal. I was using one from another brand that was $20 more and wasn't even coming close to the same results. Hydrating and easy to use, what isn't there to love? Added Bonus: 20% off a future tarte purchase! Boxycharm did a great job of bringing in spring!